I’m a freelance sound engineer, a mum to a toddler, and an activist campaigning for shared parental leave for the self-employed. I believe we need more mothers in Parliament. Encouraged by my own campaign experience I am now partnering with maternity discrimination pressure group, Pregnant Then Screwed. This month we are launching a new series of events, Pregnant Then Elected, to get more mothers into public life. The October 25th event is already sold out but more are in the pipeline. Why shouldn’t the next elected MP be a working mother? To paraphrase Jess Phillips MP- “If you ever wonder if you are good enough to stand for election, just look at around you”. If you look at the middle-class, middle-aged, middling ability white men who run the country (yes I know our PM is a woman, but we aren’t seeing many policies right now that help women), and think you can do better, you probably can. My own campaign began after I talked my husband into building a website, ran some surveys, and began raising awareness with colleagues and trade bodies in the creative industries. Before I knew it, there was a snap-election. The Labour Party had listened to us and included shared parental leave for the self-employed in their 2017 manifesto. We had pieces in most national papers, helped in no small part by my twisting the arm of every pop star I’d ever worked with. While the headlines about politics have been pretty depressing recently, no matter what your political persuasion, I’ve found engagement with politicians anything but. Politicians of all parties have been generous with their time, and been sympathetic to the issue. Despite broad political support, getting the government to take action has been difficult. Some of the paralysis can be explained by Brexit, but I think it goes deeper than that. The Taylor Review, to which we contributed, recommended that parental benefits for the self-employed should equal those of employees. The Women and Equalities select committee made several recommendations, including dedicated paternity leave of at least 6 weeks. Even a senior MP, Harriet Harman, proposed a system of proxy voting to enable MPs to take baby leave. Yet none of these recommendations are law at the time of writing. If MPs cannot even prioritise their friends and colleagues having baby leave then our system of representation is seriously flawed. When opportunities to minimise the motherhood penalty, that holds back the 80% women who have children, are missed again and again, the system is well and truly broken. Pregnant Then Elected is an event aimed at encouraging mothers from every background to run for Parliament, and we have reserved spaces for mothers who are BAME, disabled or on low incomes, as we need all voices of motherhood to be heard. Our aim is to demystify the process of standing for office. And we will be asking our speakers how they have coped with the challenges of combining politics and motherhood. On October 25th we will hear from women in all stages of their political careers, from activists, councillors, MPs and peers. The confirmed speakers include Councillor Rezina Chowdhury, Caroline Noakes MP, Tracy Brabin MP, Kemi Badenoch MP, Tulip Siddiq MP, Baroness Sal Brinton, Amelia Womack (Greens Deputy Leader) and Sophie Walker (WEP Leader). Panel discussions will be chaired by Frances Scott from 50:50 and Aceil Haddad from Pregnant Then Screwed, with lots of time for questions from the audience. Our first event sold out within a couple of hours of putting it on Instagram, but we have a mailing list for people that are interested in future events – we are planning to take Pregnant Then Elected around the country! Here is the signup link. 50:50 Parliament want to encourage, inspire and support political engagement with our #AskHerToStand programme! 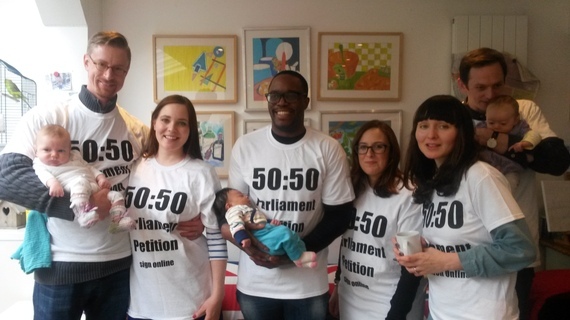 See our campaign video: What is 50:50 Parliament? See 50:50 Written Submission to the Women & Equalities Select Committee – highlighting the range of solutions and many reasons that this is such a crucial issue.